As previously reported earlier this summer, Ideat Village may not be happening this year but Rock Lottery, one of the festival’s most popular (and now enduring) events, still is. So what’s a rock lottery you ask? Well, as the name suggests, a collection of bands are formed at random from a pool of participants who then have two weeks to learn 2-3 songs to be performed live. In previous installments the bands were judged in several categories including ‘Best Merch’ and ‘Best Overall’ and awarded prizes donated from an array of local shops and artisans. The results have thus far been pretty spectacular, with at least one Rock Lottery band (2011’s Millionaires) going to actually become a band (Killer Kowalski). Several past participants whom we’ve talked to have also raved about the experience both as a means to meet other area musicians and also as a way to strengthen the existing musical community at large, not mention just being really darn fun. This year’s drawing will be held this Saturday, August 10th at New Haven’s Anna Liffey’s, with the actual follow up show occurring on Saturday, August 24th at Cafe 9 (additional dates will be added if needed). Those wishing to participate can still do so by e-mailing ideat_village@snet.net with your name, contact info, and instrument of choice: vocals, guitar, bass, drums, or ‘other’ (i.e. keyboards, trumpet, kazoo, etc). According to event organizer Nancy Shea, this year’s Rock Lottery will be different in that anyone who wishes to participate will automatically be drawn into a band (in previous years some participants were excluded, purely by luck of the draw). So anyone who is looking for some rock n’ roll glory, here’s your chance. 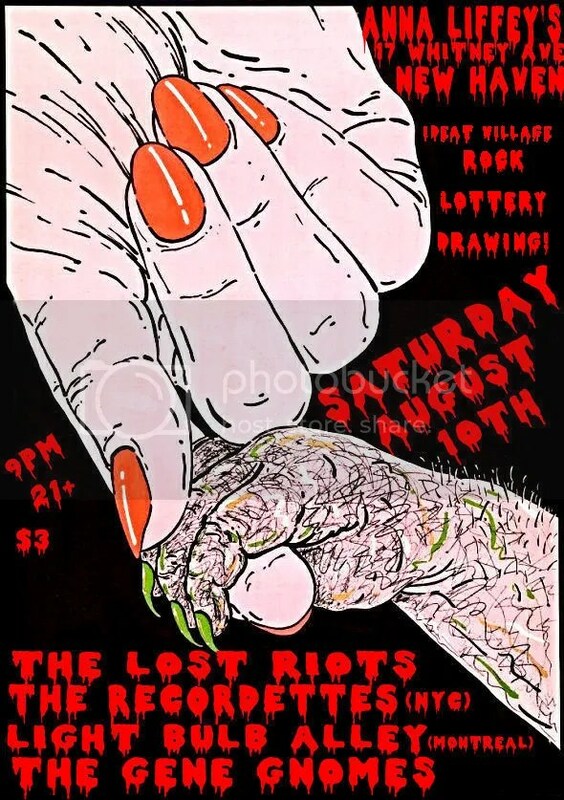 In addition to the drawing this Saturday, local punk/garage outfits The Lost Riots (hot off their show on Aug. 9th at NYC’s Mercury Lounge) and The Gene Gnomes will be performing as well as NYC’s The Recordettes and Montreal’s Light Bulb Alley, surely adding to the night’s festivities. Great music, Great friends, Rock Lottery, Anna Liffey’s, do we need to say more? Those wishing to participate in the Rock Lottery please e-mail ideat_village@snet.net.